OKLAHOMA CITY (AP) — A tea party-aligned Edmond pastor seeking to oust a two-term state senator has filed a defamation lawsuit against his opponent and a political action committee that has funded ads critical of his business dealings. 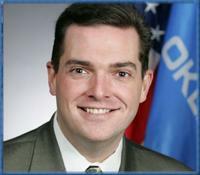 Paul Blair filed the lawsuit Thursday in Oklahoma County District Court against Senator Clark Jolley and the Coalition for Oklahoma's Future, a PAC funded by contributions from some of the state's largest corporations. Blair alleges in the suit that radio and television ads that claim Blair's businesses violated state tax laws are "presented with reckless disregard for the truth." Jolley, also of Edmond, called Blair's decision to sue "regrettable," while an attorney with the coalition, Robert McCampbell, said Friday the ads are factual and that Blair's suit appears to be "mainly for political spin."